If you can't "run for the hills"
-- Your heritage and cultural background does not support you running from extended family members (like in-laws, parents, siblings), but really expects you to continue supporting them, even at your own expense. In classical mythology, Narcissus was a young man who fell in love with his own image reflected in a pool of water and wasted away from unsatisfied desire. In modern terms a narcissist is a vain, self-absorbed, arrogant individual with a grand sense of entitlement. Narcissistic tendencies include the need to be perfect or in control at all times. Narcissistic attitudes and behaviors are epidemic in our society. The American Psychiatric Association estimates that one out of every one hundred persons meets the criteria of severe narcissism. According to the author, "our culture is full of narcissistic influences that numb us to the reality of the problems we face." In fact, unreality is the hallmark of narcissism. Their distortions of reality can cause others to question themselves and doubt their own perceptions. Narcissists will go to great lengths to promote fantasies that sustain their grandiosity and omnipotence. Many prominent elected officials, sports idols, and entertainment figures are narcissists. They also head large corporations and lead flocks of the faithful. Many of us encounter unhealthy narcissism in some form every day. Narcissists see themselves as "special people." They know better than you do. They are also very shame-sensitive. They avoid shame at all costs. They are unlikely to self-correct their intrusive or inconsiderate behavior just because you call attention to it. When failures occur, they portray themselves as victims and blame others for their misfortune. Gossip, backbiting, and bootlicking are prevalent in work environments dominated by a narcissist. The narcissist sees power as his due. This is why many achieve management positions. In such positions they practice stretching employees until they break and then get rid of them. This is called "rubber band management." Narcissists are also very aware of shifts in the balance of power. In this book author Sandy Hotchkiss presents an excellent general description of narcissism and covers how to deal with the narcissists in our lives. Knowing the narcissist's weaknesses and tendencies will help you effectively deal with narcissism. Chapter 16 is titled "Narcissists at Work: The Abuse of Power." This chapter is well worth the price of the book. It covers the narcissistic problems of poor interpersonal boundaries, scapegoating, shameless exploitation, envy in the workplace, and ways narcissists seduce us. The chapter ends by providing four guidelines for survival with a narcissist in power. If you find yourself working in a toxic environment headed by a narcissistic manager, you will want to read Why is it Always About YOU?. So many light bulbs came on I felt like a Christmas tree! Very interesting and clearly set out exploration of the characteristics of the Narcissist. Particularly illuminating for those in a relationship with an undiagnosed Narcissist,who still believe it's all their fault that things are somehow 'not quite right'. Key quote from the book: "When you enter the web of the Narcissist, you leave yourself behind." This author is a genius. The book was amazingly on target. Narcissism is a complex and convoluted personality disorder and the author has it precisely pegged. All the obvious characteristics down to the minutest subtle intricacies of this pathetic, self-centered persona are presented in an easily comprehensible manner. Almost every page I found myself saying out loud.... Oh my God, she's got it right, that's it!!! Such clarification is emotionally liberating. The narcissist is adept at draining your life force and without an iota of compassion. Their energy field must be constantly nourished by tapping into anothers. It IS... ALL about them. This book puts things in perspective, clarifies and shines a laser light on this personality disorder and offers suggestions to help recognize, assess, evaluate and protect oneself from these emotional vampires. We all have that one person in our life whose ability to manipulate the heart strongs is so masterful that it takes years to uncover. Do not waste anymore time with those who truly believe the world is out to get them, need to cater to them, indulges in some kind of disturbance that only causes turbulence to those around them. Being a friend is great. Everyone has their moments. But the cliche rings true .... take care of yourself first and then empower others to do the same. Friendships are an energetic exchange ... and when one person is constantly deprived by the demands of another ... it is time for an overhaul of boundaries and parameters. Is not a good jumping-off point for anyone interested in NPD, as it does not establish how to differentiate between a person high in self-interest and a truly disordered personality. Is a little light on citations of scientific studies and instead reads more like pop-psych. Includes a referendum on Western culture which is not truly constructive or educational. to finally accept that she was causing me so much grief and take on board the fact that two of her daughters did not get on. I rate this book highly and very easy to read and understand. Many thanks to Sandy Hotchkiss. "Why is it always about you" is about recognizing the narcissism in yourself and coping with the narcissism in others. The book is not just about Narcissistic Personality Disorder which, the author says, is rare, but rather about that fact that we all have varying degrees of narcissism ranging from healthy tendencies to malignant mental illness. I am unconvinced by the author's psychoanalytic theories regarding child development but some of the more practical advice on coping may be helpful. 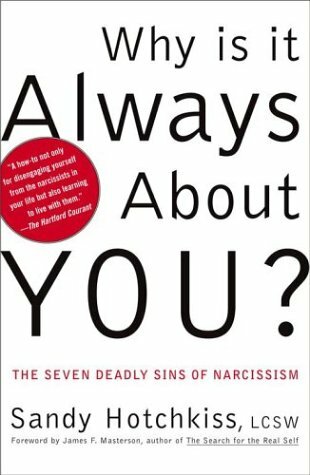 The last section, "Only you can prevent narcissism" is about how moral relativism, the misguided self-esteem movement, and certain parental attitudes have largely contributed to the raging feelings of entitlement so pervasive in this narcissistic society in which we live. This section alone is worth the price of the book. This book encompasses two separate, if related topics. One is that referenced by the title, describing the hallmarks of those with Narcissistic Personality Disorder, how they came to be that way, the workings of their internal worlds, and how to deal with them when one must, or chooses to. As in many popular psychology books, theories are presented as facts without supporting data. Having lived long enough to see a number of these psychological "facts" come and go, I am a bit skeptical of etiological explanations. However, there is useful information here for those trying to deal with an NPD person. I would add from my personal experience that Narcissists seem to lack consciences, being somewhat like "Sociopath Lite" in this regard. I found the case histories to be more descriptive than the explanative material. Do you encounter narcissists frequently? IM SO BOTHERED BY THIS BOOK....HERE'S WHY!!!!!!!!!!! I do accept the concept of NARCISSISM. WE ARE ALL NARCISSISTIC TO SOME DEGREE! THIS IDEA THAT WE HAVE TO BE ARMED TO DEAL WITH OR RUN FROM "THESE" NARCISSITC PEOPLE IS INHERENTLY, MUTUALLY EXCLUSIVE, AKIN RO RACISSM! THE CULTURE FOR HUNDRED'S OF YEAR'S AND MORE. CHOICE AND WE WILL BE BRAINWASHED TO SOME DEGREE BY THE CULTURE. MUCH OF WHAT WE TAKE IN BY OSMOSIS IS SHAMING AND GUILT INDUCING. THE PEOPLE RUNNING FROM NARCISSITS ARE ALSO NARCISSISTIC. WILL BE RUNNING FROM US. THE GREATEST THINKER'S WE HAVE TODAY. THIS IS NOT AND US AND THEM SITUATION. A NARCISSIST BASED ON ELITISM. IT STEM'S FROM EARLIEST CHILDHOOD AND ON INTO THE DEVELOPMENTAL STAGES. ABSOLUTE CERTAIN TO GET IF THE PARENTS ARE UNWILLING TO FACE THEIR CHILDHOOD PAIN. ISSUES OF NARCISSISM AND MANY MORE STEM FROM OUR CHILDHOODS. BECAUSE IT HURTS, BIG TIME. BUT FEELING THE PAIN WHILE ONE RECONSTRUCTS THEIR HISTORY TO FINALLY REVEAL THE TRUTH IS THE WAY TO REAL, FREE LIVING. THE ROAD TO GETTING BETTER MUST INCLUDE COMPASION FOR ONESELF. THAT PLACE INSIDE THAT ALREADY FEELS BAD, THAT STEMS WAYYYYYY BACK. Shamelessness, Magical Thinking, Arrogance, Envy, Entitlement, Exploitation and Bad Boundaries are the seven deadly sins of narcissism. "Their needs are more important than anyone else's, and they expect to be accommodated in all things. They can't comprehend why they might not always come first." Sandy Hotchkiss is clear and informative. In this book about saving yourself from the narcissists in your life, Sandy Hotchkiss explains what the signs of someone who is not just a bit selfish or a bit self-centered, but someone with a narcissistic personality disorder. She is clear and focused on who these individuals are, how to recognize them and even an idea of how they arrived at this point in their lives. They have taken their normal tendencies and elevated them to a higher, more significant and much more unhealthy level, for them and those around them. With a little personal insight and understanding most people have the capacity to protect themselves from the freefalling damage that is dished out by those with narcissistic personality disorder. While a narcissist will most likely NEVER admit that there is a problem with their behavior, there are ways to effectively manage them and to protect yourself (and your children) from their damaging controlling behavior. Dealing with someone who must be the center and focus of everything, who is never wrong, who feels eminently entitled to everything and anything and who completely lacks any real emotional connection is difficult but not impossible..........and much less difficult than being under their control for the rest of their lives. I really enjoyed this book. It answered a lot of lingering questions about my childhood and the parenting or lack there of that I received growing up. I mention the warning because the book made me see some of the ugly that I had inherited. The good news is it took my inner focus of what was wrong with my childhood and shifted it to how I can make sure my children don't harbor the same contempt for me. IF YOUR RELATIONSHIP FEELS NOT QUITE RIGHT, READ THIS BOOK! It has been said that relationships with narccissists are, possibly the most confusing and difficult to endure. This is an essential handbook for anyone entwined in a relationship, or considering marriage to a chronic attention junkie. Once they have you in their grip, they morph into someone who cannot apologize,recognize your abilities and talents, puts you down,and/or calls you "crazy," "difficult," and/or "incompetent." Narccissists are masters at subtlety and at systematically exploiting you financially, socially and emotionally while eroding your self-esteem to the point that you no longer recognize yourself. BUT NOT IN THE BEGINNING. The inportance of this book is to inform and warn. Narccissits are parasites who will charm,seduce,and flatter you until you say "I Do." or otherwise commit and hand over your life. Long familiar with the patterns of, if not the vocabulary of, the narcisstic personality (and what woman isn't? ), delving into its unique characteristics, I am surprised to see the syndrome invoked into the political arena in the last several years, by even trusted advisers - perhaps the source of the idiom, "politics makes strange bedfellows?" I bought the book, actually two of them thinking it might provide some insight into the narcisstic personality. But I think the author tried too hard to write a whole book on something that perhaps a paragraph or a chapter might cover. At least I am unconvinced that she had a book full of information to impart. I think that every personality disorder became narcissim to her. I think that every response that wasn't appropriate in anyone's behavior became the response of a narcissist or evidence that the person was suffering because they had been around and conditioned by narcissists. It seems that when someone wants to write about some personality disorder they ascribe all improper behavior to that disorder. I think narcissim is much narrower than she describes. To the credit of the author, she gave interesting case studies but never really got into why that particular case illustrated her point. Written as an introductory level book, Hotchkiss delivers and accomplishes her goal of helping to increase the awareness of the prevalence of narcissism. If, according to estimates, 15-20% of the population struggles with narcissism, then you are going to have to deal with it. Go to any organization and you're likely to find some there--most often, the higher you go in a hierarchy. Hotchkiss wasn't precise enough in describing where narcissism comes from. At the same time, I don't blame her. Getting at the crux of narcissism means doing an in-depth study of childhood and adolescent psychology, and most people buy this introductory book just to try to figure out how to deal with their narcissistic boss, family member or lover. Hopefully, if one so chooses, there are books which do just that. Why it is NEVER about me!! Why is it always about YOU ??? And the fault wasn't mine! If you've ever had a Narcissist blow through your life, read this book. Well-written; the best book I've read on the subject. The commentary on the social aspects of narcissism makes this author's approach relevant to every reader. Practical, realistic coping strategies as well as models for good-enough parenting. Great book for parents and teenagers to read together! Synopsis: Narcissism is a healthy, necessary stage twice in a person's life, during the toddler and teen years, and gives an individual an inflated sense of confidence that enables him or her to leave the security of the parental bond to explore the world with newly acquired abilities. If children receive good-enough parenting when reality deflates this bubble of omnipotence, they reach the end of their narcissistic explorations with a newly integrated sense of self and awareness of the separateness of other people. If they are traumatized or are insecure in their attachment to primary caregivers at these crucial stages, they never "graduate" from the school of narcissism, and become "toxic people," viewing others merely as extensions of themselves and therefore without separate needs and feelings. You probably encounter narcissistic people every day without understanding why they are so rude, have an unfounded sense of entitlement, poor boundaries, or seem to be more "special" than other people. Many of us have been raised in families that pass down narcissitic vulnerabilities, leaving us prey to narcissists, who are always on the lookout for people who can be manipulated into supplying external validation of their "specialness," either by annexing you and your talents to serve them or by deflating you so as to inflate themselves. The current cultural endorsement and social approval of narcissistic traits also prepares us to be victims, even if we are otherwise psychologically healthy.